Currently the only article in this category is an item on Barney Oldfield's exhibition run to set a speed record on a tractor in September 1933. Barney Oldfield never stopped dreaming up ways to leverage his fame to line his pockets. Long after he had retired from driving, he staged stunts like setting speed records with tractors. This is the subject of this 1933 article. With Charles Chevrolet, the eldest son of Louis Chevrolet, Oldfield used the stunt to promote Allis-Chalmers tractors and Firestone tires. 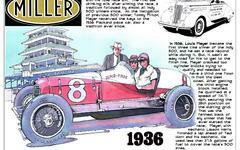 This event is highlighted in William Nolan's biography, "The Life and Times of Barney Oldfield, America's Speed King."